Spotting sunken concrete outside your home is easy. Inside, it’s a different story. Identifying sunken concrete externally isn’t too hard. Sinking concrete slabs in your pool area, garden landscape, patio, stairways and driveway are easy to see. These slabs will appear to have depressed or tilted at uneven angles in the ground. They now pose a danger to your health and safety due to the fact they’re creating an uneven surface on which someone could trip. Identifying sunken concrete indoors, is a little more challenging. Sunken concrete in internal environments like your home, garage or workspace is less obvious. However, it still poses a danger to your building’s structure as it’s experiencing an immense amount of pressure from the ground up. This pressure can cause damage throughout your building. If you’re concerned and want to know what to look out for, read on. If one side of your concrete floor has sunk deeper than the other, it may cause the floor to slant. This will create an unwanted step to form and a dangerous trip hazard. When you and your family walk across the floor, you’ll are walking up or down steps. If the central area of your concrete floor is sinking downwards, your floor will bow. Unlike sign no. 1 where the floor inclines or declines, a bowing floor will subtly dip in a concave shape. The outer area of the floor will be a touch higher than that of the central area and if you were to place a ball down, it would roll towards the centre of the room. After sometime internal doors will begin to jam as the forces of the structure alter. Skirting boards are meant to sit flush against the base of your interior walls. 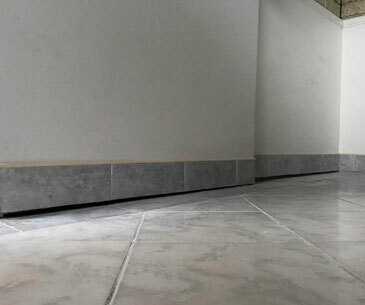 If they’re pulling away to reveal gaps underneath the internal walls of your home, a sunken concrete floor may be the cause. The skirting has moved, but the walls have not. Are your sunken concrete floors worrying you? If you’ve experienced any of the signs mentioned on this page, you may be a touch concerned. Don’t worry too much. We’re ready to help starting with a FREE house inspection. We take a look at your sunken concrete at no charge. Our sunken concrete releveling quotes come with easy to understand computer-generated drawings that detail our proposed solution. 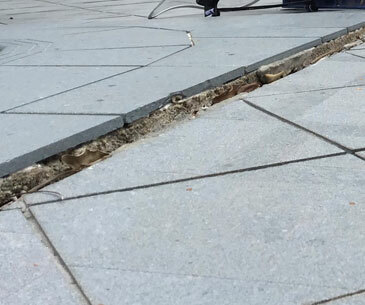 Releveling of your sunken concrete shouldn’t take more than a day. We never dig up or rip out sunken concrete floors or slabs. Unlike many other building companies, we only typically charge between $3,000 to $7,000 to relevel sunken concrete. See our full list of prices. We’re thorough in what we do, sunken concrete we relevel stays level. In the rare case your concrete slabs and floors sink again, we’ll be back to relevel them at no extra cost. Book a FREE inspection of sunken concrete today!